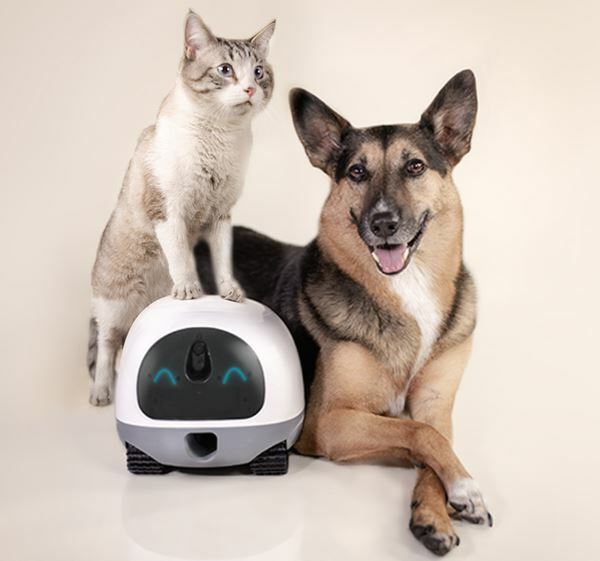 VAVA Pet Cam Robot: The animal's new best friend? News VAVA Pet Cam Robot: The animal’s new best friend? The dog is not only man’s best friend, but generally has a very high status. There are also many cat lovers in the world. But what do our four-legged friends actually do while we are on the road? In order to find out and to keep the pet busy when you don’t have time, the Chinese company VAVA will soon introduce the Pet Cam robot. The Chinese technology manufacturer VAVA has so far been able to pay a visit to our editorial office with a daylight alarm clock and Bluetooth in-ears, and various cameras also come from the tech producer. Thus, at least in the camera area, there is some expertise available that is helpful for monitoring the pet. What does a robot have to bring with it in order to be a meaningful enrichment for the pet and the owner in the household? Right, he must keep the dog or cat busy and relieve the owner of work. How does one slip in with the four-legged friend at the smartest one? Right, with a treat. The small snack for the pet has to be fed into the robot beforehand and comes from the “mouth” of the robot. It doesn’t sound so tasty, but the animal won’t care. Above it there are two eyes that could have sprung directly from the VAVA logo. Using the built-in 1080p camera with 120° wide-angle, the pet owner is able to follow what is happening in the living room while on the move. And he can even communicate and interact with the pet, of course via app control. The app is packed with a lot of functions. When the app is finished, it becomes the core of the robot. Not only can it be used to steer the robot, distribute snacks and follow the live camera image, videos can also be recorded. Push notifications inform the user about activities at home. For example, the pet cam robot recognizes an increased barking of the dog and informs about it. However, the robot is not just a listener. The app can also be used to talk to the animals (or anything near the robot at the moment). For such a small robot the VAVA Pet Cam robot can do quite a lot. 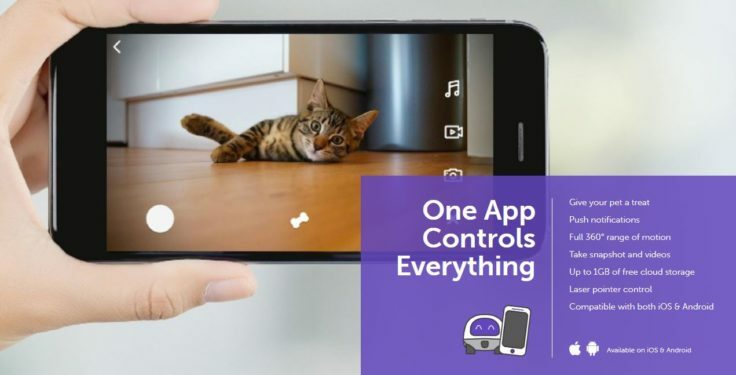 For cat lovers, there is also an integrated laser pointer on the pet cam robot that can be switched on with the app. Could be a good way to keep your cat busy while on the go. The app will be available for both Android and iOS as well as 1 GB storage space for recordings in the cloud. In addition, the robot can also be used in the dark, a kind of night vision function is integrated in the software package. Of course, it is questionable how animals react to the robot, not every dog is a friend of new roommates. This is surely a question of the animal character and the acclimatization, must be considered before a purchase of the robot of course. Moreover, in the videos published so far, the small robot moves somewhat slowly on its armor-like chain drive. First, the VAVA Pet cam robot will be subjected to the opinion of the Indiegogo community and must hope for a financing, which is very likely. The robot should cost $149 in the initial offer, but there is still a lot to do until the final release. We find the robot quite interesting, of course the opinions will differ with such a topic. But if the camera image goes beyond the mere recognition of outlines and the app works well, the small robot could be an enrichment for pet owners. What do you think? This would be perfect for my dog, as he has major stress issues when I’m not around. Just a suggestion, I have two cats. They tend to be rough on toys. You might need to add weight to the base of the robot. Maybe the bottom can be the base plate where the components are mounted using steel or something cheap and heavy. I picture my cats flipping something like this over and immobilize the robot. Product sounds like a great idea, it would deter animals from tearing up the furniture by keeping them busy.